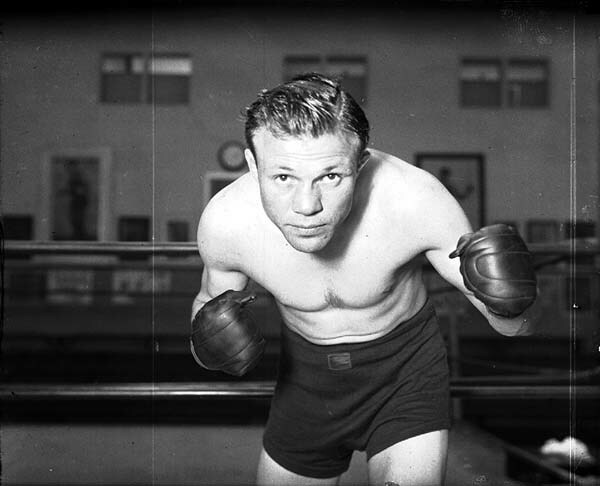 Luigi Giuseppe d'Ambrosio (November 8, 1913 – April 24, 1995), aka Lou Ambers, was a World lightweight boxing champion who fought from 1932 to 1941. Managed by Al Weill and trained by Charley Goldman, the "Herkimer Hurricane", as he was known, began his career losing only once in more than three years when he faced future hall of fame lightweight champion Tony Canzoneri on May 10, 1935. Canzoneri defeated him over 15 rounds on a decision. Ambers did not let the defeat discourage him. He won his next 15 fights and gained revenge when he captured the lightweight championship by decisioning Canzoneri in 15 rounds on September 3, 1936. On August 17, 1938 Ambers met Henry Armstrong in a historic title fight. Armstrong was attempting to become the first fighter in history to win and hold three world titles simultaneously. In a great fight, Ambers was knocked down twice, in the fifth and sixth rounds, and appeared badly beaten. He then mounted a great comeback, but lost the controversial split decision. A rematch was inevitable. The rematch was as controversial as their first bout. Armstrong was penalized for low blows, which enabled Ambers to capture the 15-round decision on August 22, 1939. This was Ambers last great performance. On May 10, 1940, Ambers defended his title against the wild, free swinging, Lew Jenkins. Jenkins scored an upset when he knocked out the defending champion in the 3rd round. Ambers sought a rematch, and after a tune up win over Al "Bummy" Davis, he again faced Jenkins. 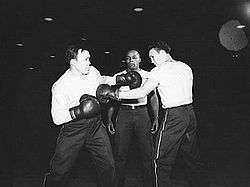 This time he was knocked out by Jenkins in the 7th round on February 28, 1941. Why did Luigi use a ring name; he was afraid his Italian Mother would find out that he was a fighter. He knew she would not approve of his occupation and to keep Moma from finding out, he fought as Lou Ambers. Although Ambers wanted to continue with his career, his manager, Al Weill, convinced him that he was through, and to retire. Ambers never fought again. After his retirement from boxing, Ambers operated a restaurant, and also worked in public relations. He died on April 24, 1995 in Phoenix, Arizona. He is interred at the Saint Francis Cemetery in Phoenix .